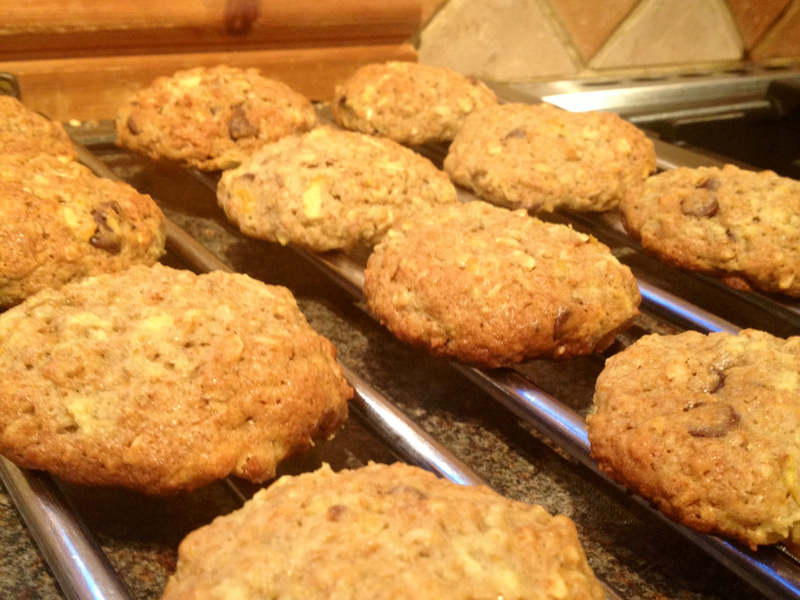 Having done a fair few indulgent bakes, this week I’ve decided to do a healthy cookie…. yes that’s right, I said healthy! Woohoo! And even better they’re really yummy and don’t taste like cardboard as a lot of healthy biscuits do. My Dad went mad for these and I had to ban him from the kitchen before he polished off the lot, so I guess that’s a seal of approval! There’s loads of stuff that’s good for you packed into these so no need to feel too bad about eating 1 or 2… or 3… or the whole lot. You can easily swap around the ingredients in these cookies to suit your preferences, raisins or any other dried fruit would work well, or swap the almonds for hazelnuts for example. The possibilities are endless! Happy baking! 1. Preheat the oven to 180°C and line your baking sheets with greaseproof paper. 2. Lightly toast the chopped almonds in a dry pan. 3. Cream the butter and the sugar. 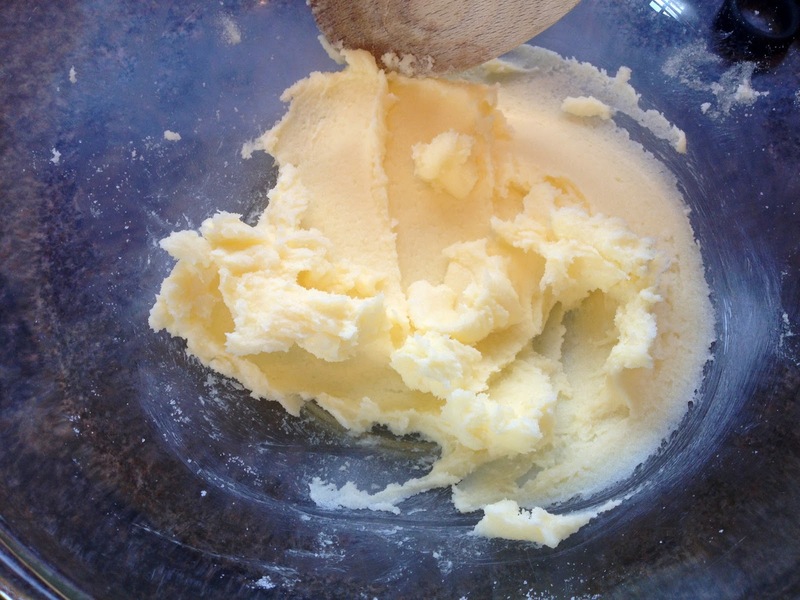 This requires a little elbow grease but the softer the butter the easier it is. Soften it up in the microwave if necessary but don’t melt it. Add the honey and mix through thoroughly. 4. 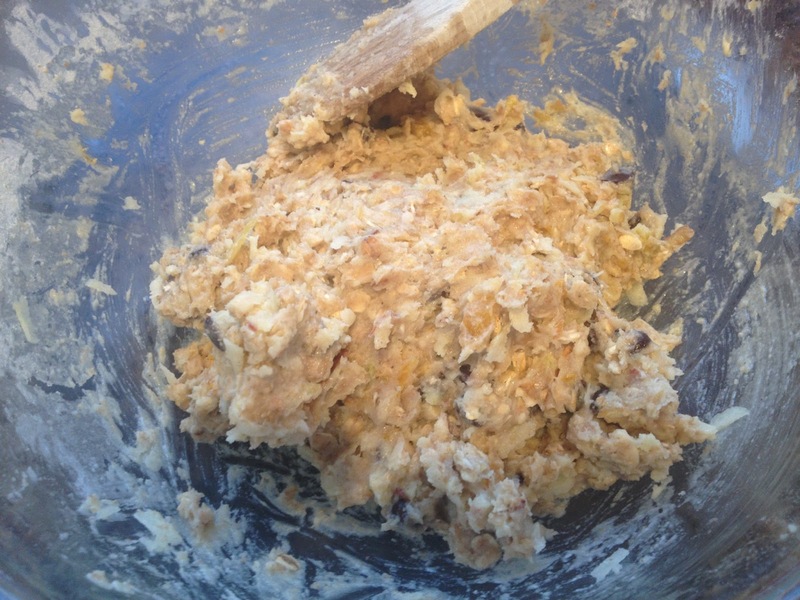 Add the egg and beat into the mixture. This will go a bit a bit runny and lumpy at first but beat for a few minutes until smooth and thoroughly mixed through. 5. Sift both types of flour, salt, and bicarbonate of soda into the bowl and fold into the mixture. 6. 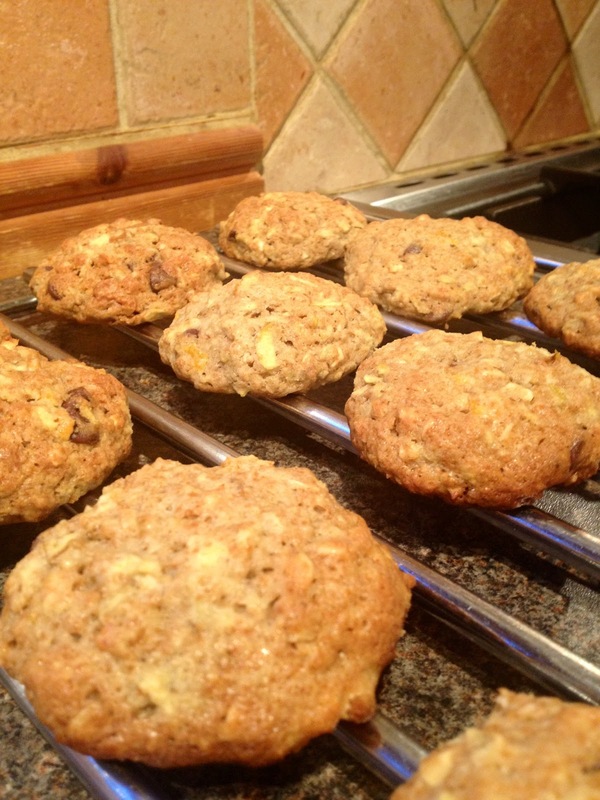 Stir in the oats, grated apple, almonds, chocolate chips and apricots. 7. Take a tablespoon at a time and place onto the baking sheets spaced well apart. 8. Bake for 12-15 minutes until golden.